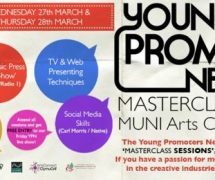 Young Promoters Network have set up a series of Masterclass events for young people (aged between 14 – 25) who are interested in a career within the creative industries. 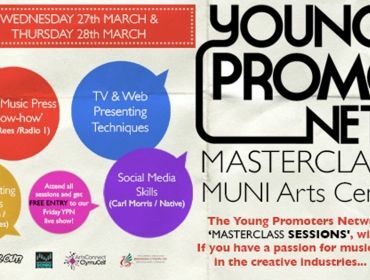 Young Promoters Network consists of young people, residing in Rhondda Cynon Taff, aged between 14-25, eager to help arrange live shows and promote young emerging acts. Combining skills, experiences and resources, the YPN has been instrumental in bringing high quality live music events to young people in RCT. Local acts The People The Poet, Safari Gold, Straight Lines and Reaper in Sicily are all bands that have emerged from under the YPN radar and they are always looking for more new acts to endorse and support. For young people who don’t necessarily have the confidence or experience to stage their own events, there are many aspects that might seem daunting at first. The YPN supports and mentors committed individuals with first hand experience, good practice and regular communication. Networking and volunteering opportunities to music events and forums, are all available to members. Previous opportunities include industry experience with Plugged In magazine, Orchard Entertainment, SWN, Oxjam, SWNMF, Merthyr Rocks and Pontypridd’s Big Weekend. The YPN is currently providing a valuable lifeline to bands and individuals in RCT, as well as a vehicle for individuals aiming to forge a career in the music industry. PR & Music Press ‘know-how’ – a session tailored to getting the best out of your band or brand, whilst establishing lasting connections within the industry. Hosting this session will be Elin Rees, former PR officer for BBCWales/BBC Radio 1. TV & Web Presenting Techniques, which will look at the different approaches to presenting either TV broadcast or Web based programmes. Radio Presenting Techniques, hosted by BBC Radio Wales’ new music guru, Adam Walton, will look into the world of podcasting, presentation style and how much work preparation goes into each show.